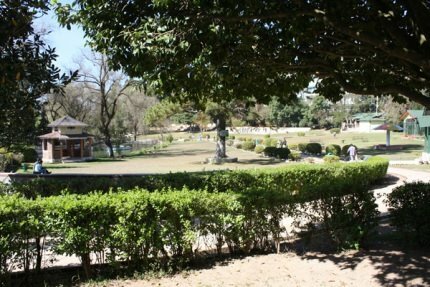 Incidentally, one of the first things you are apt to notice when you enter the Lady Hydari Park that lies in the heart of Shillong City is the Japanese style garden. The round shapes of the hedges with circular design elements, willow trees with their leaves almost sweeping the ground and the numerous small ponds scattered all throughout the garden all have a distinct Japanese influence. The Lady Hydari Park is named after the erstwhile first lady (wife of Governor of Assam... she was an avid nature lover) as Shillong was under the administration of Assam when the British ruled India. The park has paved walkways that make it easy for visitors to stroll amongst the manicured lawns and admire the fast variety of flora including an impressive collection of rhodendrons and orchids. If you come to Shillong during winters or spring then spending a lazy afternoon in the Hyadari park lawns is the perfect way to relax. This is arguably the best kid’s zone in Shillong and if you are travelling with children then do pay a visit to Hydari Park. At any given time you will be greeted with the sight of rows of bright faced kids in matching school uniforms exploring the park with their school teachers. There is a mini zoo inside the Lady Hydari Park and that’s a major attraction because it’s the only such place in shillong and its surrounding areas. If you have seen other larger zoos in India then you wouldn’t find the Hydari Park Zoo to be anything special. The place is well maintained by the Forest Department though the animals seem unhappy due to the lack of space. Check out animals like Himalayan black bear, leopard, jackal, porcupine, serow and deer and birds like hornbills, mynahs. Kites are also members of the zoo. Unlike most other hill stations in India, the zoo in Hyadari Park keeps animals in small cages leading to less than desirable situations. A lot of protests have been made to shift the animals to more spacious quarters. There is a small lake with pelicans, duck and colorful fish in it and you may amuse yourself by feeding them. There are some swings, slides and a children’s play area inside which can be a pleasant diversion for kids. The museum inside the park offers much to see though it is rather small in size. There are stuffed leopards, elephant skulls and photographs of rare species of wildlife. The aim of this mini museum is to highlight the diverse flora and fauna of this region. One of the most eye catching displays is an actual dried skin of a giant python clipped to the wall. Another interesting section is the one where roots and seeds of different plants of Meghalaya are kept on display... this is a good opportunity for a botany lesson. Though the park is rated as a top attraction of Shillong, you may skip it if a zoo or museum doesn’t interest you that much. If you are travelling with children or have some spare time on hand then visiting this is recommended. A visit to the Hyadari Park shouldn’t take up more than 1.5 hours of your time. The park is about 2 km away from Police Bazaar. You can actually walk down to the Lady Hydari Park from Police Bazaar area. You can take a taxi and catch the park as well as the nearby Crinoline Falls in one visit. Don’t bring your own car…there are parking issues here.